In this tutorial , we will integrate Spring 4 with Hibernate 4 using annotation based configuration. We will develop a simple CRUD java application, creating hibernate entities, saving data in MySQL database , performing database CRUD operations within transaction, and learn how different layers interacts with each-other in typical enterprise application, all using annotation based configuration. We will also see corresponding XML configuration side-by-side for comparison. 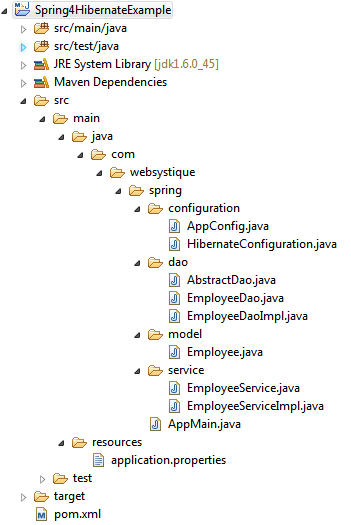 For Spring MVC based application, checkout Spring4 MVC Hibernate and MySQL integration. Let’s get going. Spring, Hibernate & MySQL connector dependencies are pretty obvious. We have also included joda-time as we will use joda-time library for any date manipulation. usertype-core is included to provide the mapping between database date-type and joda-time LocalDate. @Configuration indicates that this class contains one or more bean methods annotated with @Bean producing beans manageable by spring container. In our case, this class represent hibernate configuration. @ComponentScan is equivalent to context:component-scan base-package="..." in xml, providing with where to look for spring managed beans/classes. @EnableTransactionManagement is equivalent to Spring’s tx:* XML namespace, enabling Spring’s annotation-driven transaction management capability. @PropertySource is used to declare a set of properties(defined in a properties file in application classpath) in Spring run-time Environment, providing flexibility to have different values in different application environments. Method sessionFactory() is creating a LocalSessionFactoryBean, which exactly mirrors the XML based configuration : We need a dataSource and hibernate properties (same as hibernate.properties). Thanks to @PropertySource, we can externalize the real values in a .properties file, and use Spring’s Environment to fetch the value corresponding to an item. Once the SessionFactory is created, it will be injected into Bean method transactionManager which may eventually provide transaction support for the sessions created by this sessionFactory. Below is the properties file used in this post. In our simple example, this class is empty and only reason for it’s existence is @ComponentScan which provides beans auto-detection facility. You may completely remove above configuration and put the component scan logic in application context level (in Main ). In full-fledged applications, you may find it handy to configure some beans (e.g. messageSource, PropertySourcesPlaceHolderConfigurer) in Configuration class. As for as Annotation based configuration goes, this is all we need to do. Now to make the application complete, we will add service layer, dao layer, Domain object, sample database schema and run the application. Notice above, that SessionFactory we have created earlier in step 2, will be auto-wired here.This class serve as base class for database related operations. Most interesting part above is @Transactional which starts a transaction on each method start, and commits it on each method exit ( or rollback if method was failed due to an error). Note that since the transaction are on method scope, and inside method we are using DAO, DAO method will be executed within same transaction. Let’s create the actual Employee Entity itself whose instances we will be playing with in database. return "Employee [id=" + id + ", name=" + name + ", joiningDate="